...One Saylor's Log: Come Along! 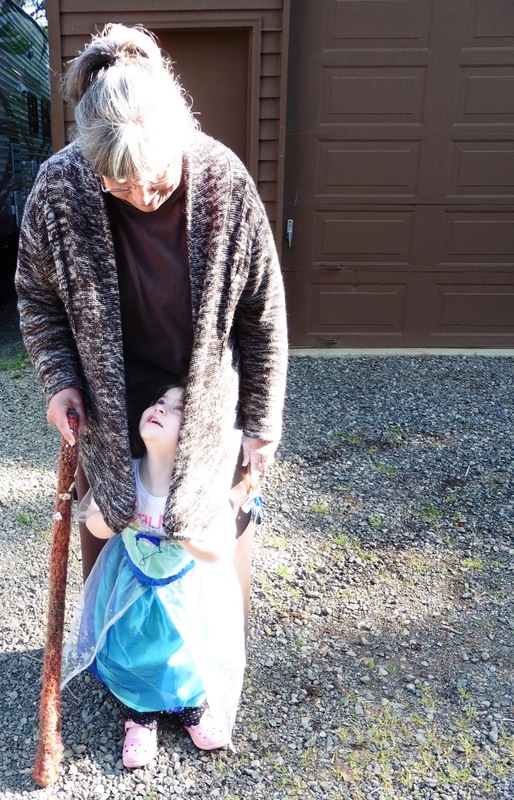 My oldest daughter, Mary Kathrine, used my camera to take a photo of my granddaughter, "Princess" Rose and me after we had been down to the front pond to see if we could see any duck activity today. Several days before we had witnessed Mrs. Mallard shepherding her ducklings from the back to the front pond. 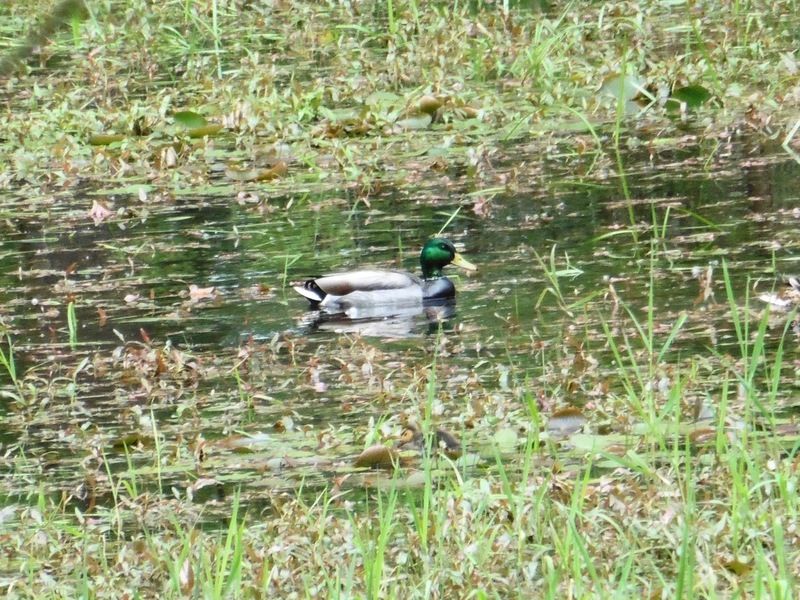 Isn't Mr. Mallard handsome? 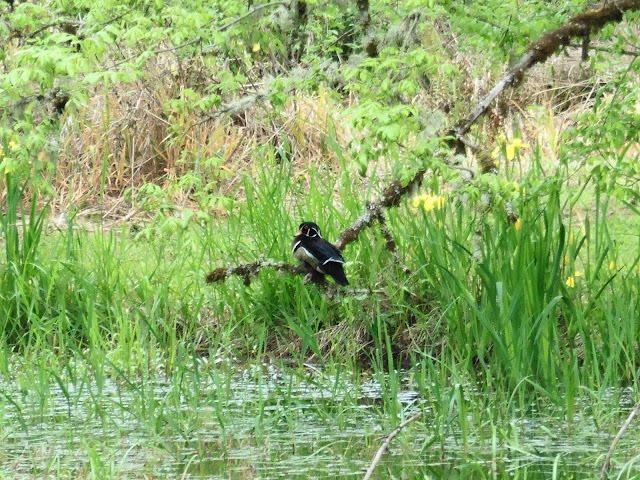 I wonder if the males are so brilliant in color so that they can distract predators from the mother mallards and ducklings. Mama Mallards kind of blend into their surroundings here. I think this is one area where the Mallards have a nest. I caught this duck just taking off from the front pond. On another day I got a photo of Mr. Wood Duck snoozing on a branch. Did you know they do that? I didn't until I witnessed it. 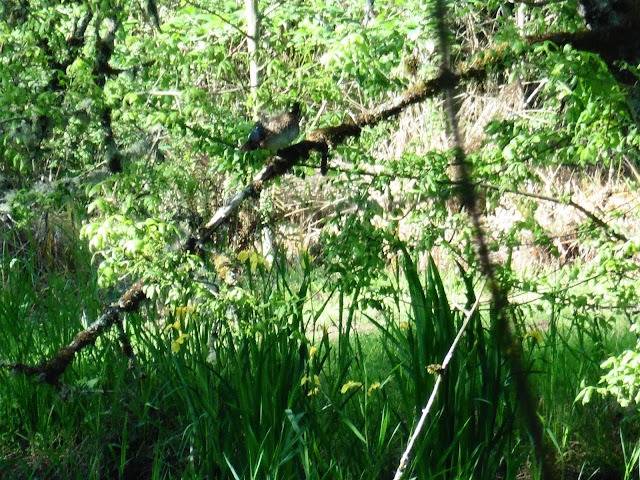 I think this is Mr. Mallard resting on a branch. My blogging friend Bethany asked if I planned to show you my finished Haystack Rock painting. I have worked on it several times since then. I think it is finished...or it is finished for now at least. Most recently I added people. Two are riding recumbent bikes like those Teresa and I saw some folks riding along the beach. I taped the three little pages on a window and took the photo with the daylight shining through the pages. The paper is a similar texture to tracing paper and I wondered how it would take the colors, so I tried three different coloring mediums. On the far right I colored both sides of the paper with woodless colored pencils to intensify the hues. Have you been coloring lately? Thanks for coming along with me! Where have you been wandering along? I do hope you will tell me. The photos of the pond and the amazing life on it would indeed make a wonderful puzzle and a great gift. I loved the effect of the acrylic splatter heart but the scriptures around make it so special, I wonder if it could be mounted or framed as that too would make a great gift. The watercolour is real treat, stunning. Take care. Sounds like you have had a busy week. 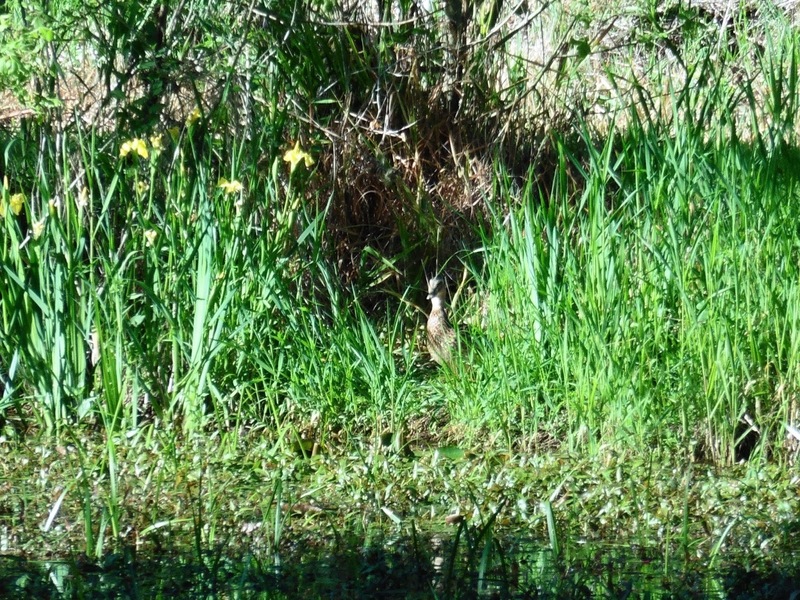 I think Heron's also eat baby alligators, at least here in Florida they do! I was walking the other day and walked right by a 2 foot long alligator sunning himself, to say it startled me is an understatement! The picture of you and your granddaughter is the sweetest. I sure didn't know ducks rest on branches. 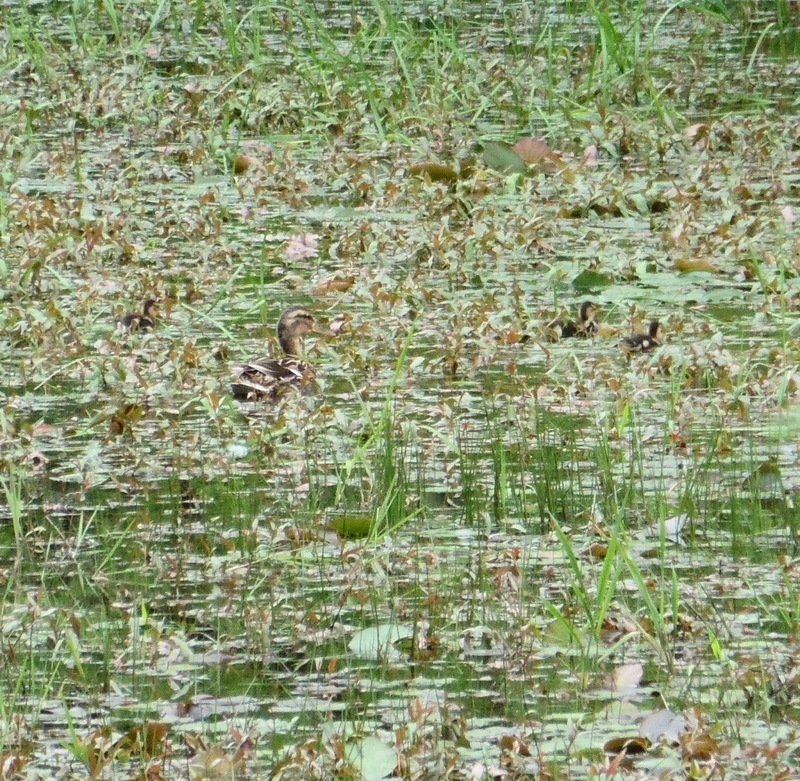 Mama and ducklings sure do blend in with their surroundings which is a very good thing. I love all your artwork. Still trying to get in the habit of drawing/painting every day (been trying since January :) Happy May! What a darling little princess you have there! It must be so much fun to spend time with such a joyful little girl. I love your finished drawing. The recumbent bicyclists add a lot of interest to an already-beautiful scene. Keep drawing and painting. I don't color. Maybe it's because I am working full-time so I have to use my free time for my most favorite arts & crafts. I like your haystack rock painting. I like your duck photos. I havevfun watching our birds lately. I've seen a few enjoy the bird bath. Last outing was picking up our grandchildren last night. Still praying for Erin's labor as it's slowly gaining momentum. Nice granddaughter photo. Always fun and right now they're playing with Legos. Happy week!! Ah Gracie. Your life is so sweet. Family and granddaughters. I love the picture of you and sweet Rose. The love on her face as she looks at her precious Grandma is wonderful. I showed Dennis your pictures of the pond and ducks and we think that one would make a wonderful puzzle. Very challenging for sure. I didn't know that Heron's ate ducks and ducklings. Oh my! 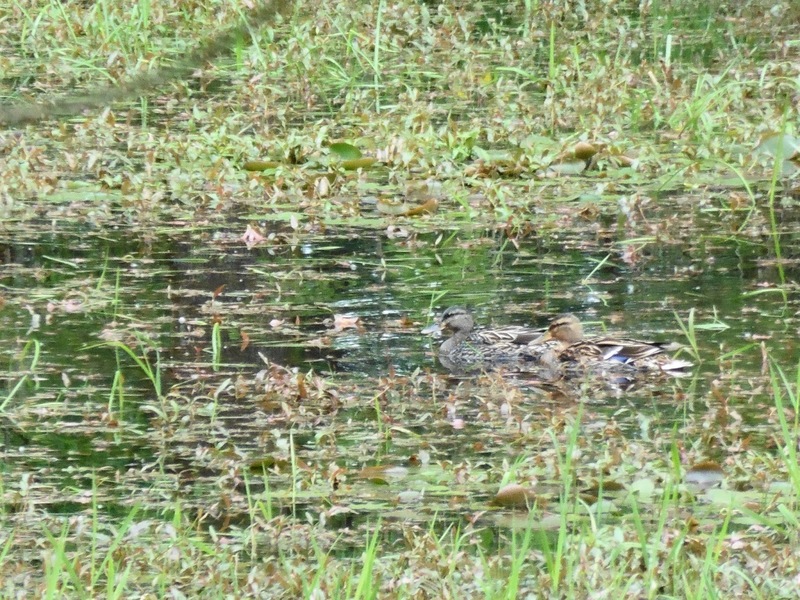 I wouldn't sleep for worrying about the sweet little ducklings on your pond. Your artwork is so pretty Gracie. We're enjoying our time with Alex. He's up walking a little and can't take the "boot" off yet. Tomorrow his girlfriend is flying in for the remainder of his visit. I hope you continue to enjoy your spring. Your granddaughter is very cute!! :) Nice colouring!! I too have been reading a lot in April. 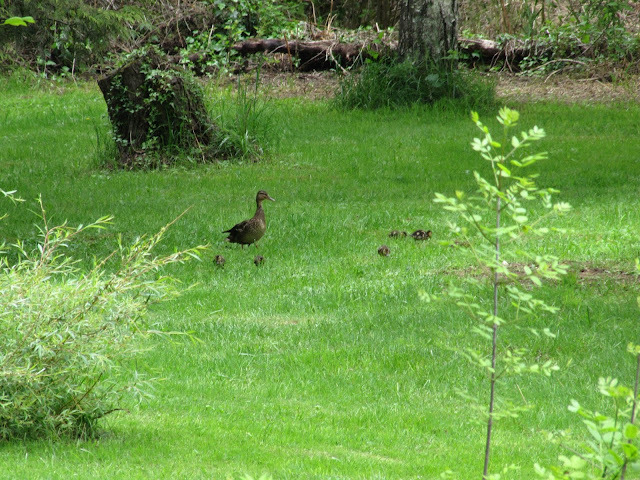 Oh my gosh...the ducklings make my day :) so heartwarming. And I LOVE the drawing! Hi Gracie, I enjoyed coming along to see the ducklings. They're really cute. Your artwork is beautiful. It sounds like you've been keeping nice and busy with your hobbies and creative pursuits. I hope you're having a good week so far! 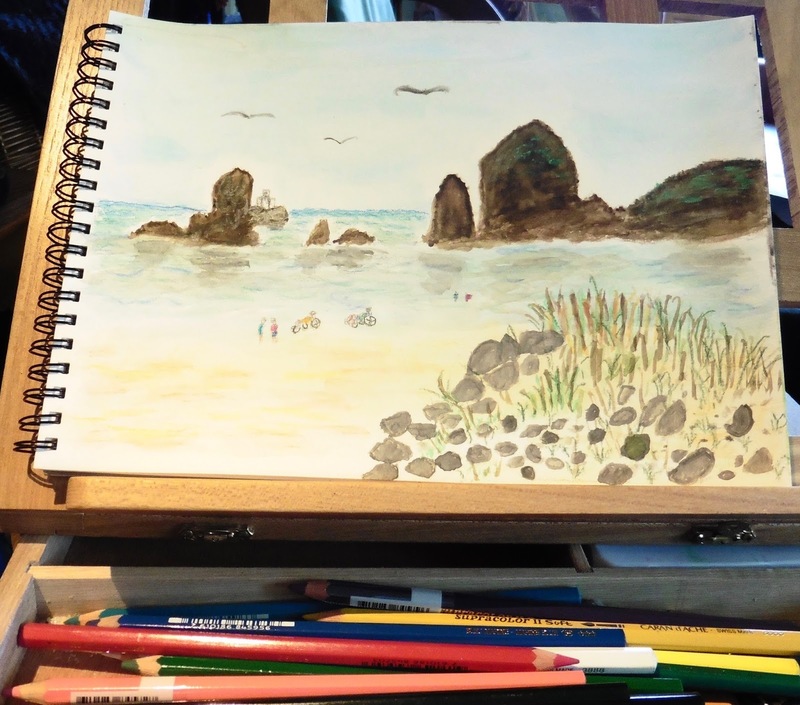 You did an awesome job on the Haystack Rock painting! Thank you so much for sharing. It looks just like your photos! Also great to see the picture of you and your granddaughter! That top picture of you and your granddaughter is priceless, Gracie! 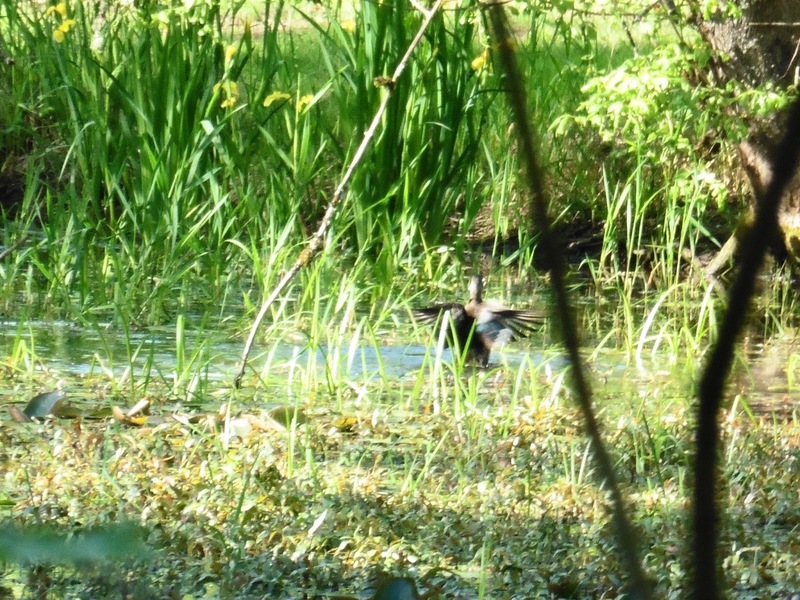 What a beautiful piece of property you live on - how wonderful to share your space with such amazing wildlife. The photos are wonderful. 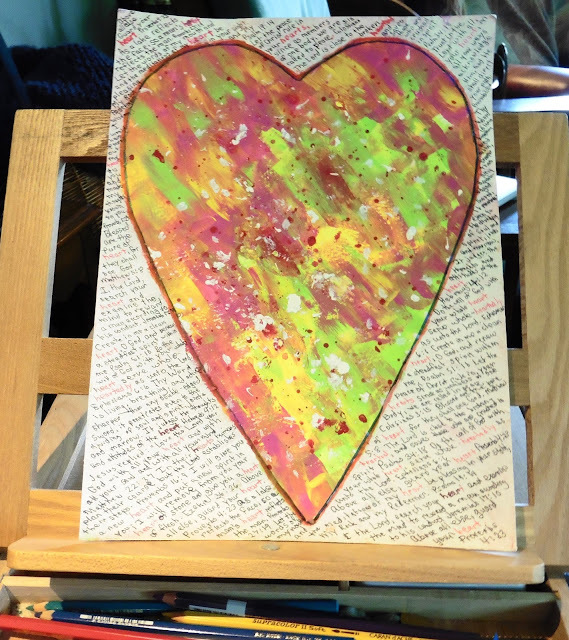 I see you've been very busy - love your paintings and the beautiful mandalas that you colored. Did you ever think of framing them? Hey Gracie! That photo of you and your granddaughter is so precious!!! And the watercolor appears to be coming along nicely! Are you going to go back into it at all? I have to live vicariously through others at the moment while my things are still in boxes lol!